Looking for a solution for your industrial, business, or personal shipping needs? You're in luck. Chicago Mailing Tube has been a long-standing provider of reliable shipping and mailing tubes. Our 3.000" x 20" self-locking, crimped-end kraft tubes are affordable, customizable, and super sturdy. If you're looking for a slight adjustment in measurements, our team can do that for you. Plus, our thorough quality-control tests ensure that your shipment will arrive safely. Every single one of Chicago Mailing Tube's products are extremely secure, require no minimum order, can ship in 24 hours, have wholesale options, and, of course, have been quality control tested. Additionally, our customer service team is friendly and committed to giving you the best service around. It doesn't matter if you're shipping one blueprint or if you have a massive wholesale order of textiles to ship. Chicago Mailing Tube's team will help you find the best match for your needs. 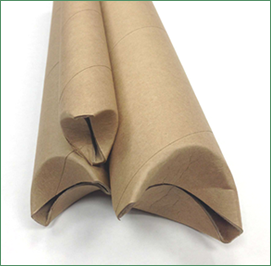 Call us or fill out our quote form to get a quote on 3.000" x 20" self-locking, crimped-end cardboard kraft tubes. Chicago Mailing Tube's heavy-duty kraft tubes with self-locking ends are perfect when sturdiness is necessary. They are great for shipping with UPS, FedEx and USPS. Uses include shipping, hardware, drapery rods, antennas, track lighting kits, metal rods and more. Crimped ends secure tightly to protect all contents.